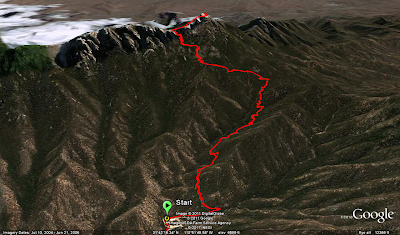 Last week Joey and I hiked to the highest peak in southern Arizona: Mt. Wrightson. Mt. Wrightson formed at least 10,000 years ago as part of the Santa Rita mountain chain when the dinosaurs decided to build a big mountain so they could see the Sea of Cortez without having to walk 200 miles. Although back then it was the Sea of our Conquering Warlord Littlefoot. But really it was a volcano or something like that back in the day. Anyway we decided to do this hike on our ‘easy’ day, however it turns out a 5 hour hike up to 10,000 feet isn’t too easy. The trail started out pretty sheltered at 5,400 feet hiking through the big Pondorosa Pine forest, then it cleared out for final few miles into pretty open rock faces scared by a forest fire. The trail was wickedly steep for nearly all of it’s 5 miles. It only leveled out at two saddles that connected a few of the peaks. I told him about some sparrows I saw flying around horseshoe bend and his head just about exploded. Joey had to show some skin for all the nice retired ladies on the trail. Anyway since Redlands was all filled up and too good for the Trek-Landis team I stayed local and did the Colossal Cave Stage Race here in Tucson. Pretty much your typical 2 day three stage race. TT Saturday morning, which I sucked it up in as ususal, Go-Kart track crit Sunday afternoon. Then 80 mile RR Sunday. The only downside was there were only 12 guys registered to race. The upside was I won 2/3 races plus the overall. In the Go-Kart track crit I broke away and soloed for most of the race by out-cornering the field. By Sunday I was one point out of the overall. I attacked a few times but mostly spent the race chasing down the other two guys in the top three. By the end of the race only three of us were left at the front of the race after 3 hours of some pretty brutal 20 mph winds. It came down to a sprint where I edged out Nick from Landis (who was leading in the points by 2) by just a wheel length. It was the first ride on all the new equipment: Zipp Wheels and Canyon bike. It all performed really well and I’m looking forward to putting it to some good use in bigger races.